Here’s the last two boards I shaped sitting on the glassing racks. In the background is a 9-0 Neo with blue resin stripe and moon flow tail. This is a wider version of the Neo model, offering maximum planing area in a shorter length. 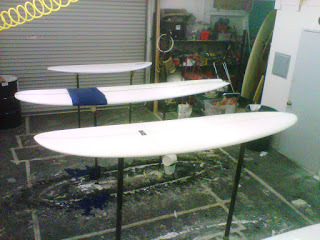 The board in the foreground is a 7-11 Egg 5-fin convertible, done in EPS/epoxy construction. This board was designed as a California travel board, with a wave-range to match most anything you’ll find in the Golden State.